MIYAVI, the “Samurai Guitarist” guitarist from Japan whom has been gaining recognition around the world for his unconventional style of playing the electric guitar, not with a pick, but with his fingers, and his original slap style. Good new, his coming to Kuala Lumpur – MIYAVI Slap The World Tour Live in Kuala Lumpur 2014. To date, MIYAVI has 3 successful world tours, which totals over 200 shows in 30 countries across North & South America, Europe, Asia & Australia. I attended his showcase back in 2012 - An Electrifying Explosive Miyavi Live in Kuala Lumpur 2012. In September 2013, MIYAVI was also nominated as the “Best Japan Act” in the 2013 MTV EMA (Europe Music Awards); which is the biggest music award in Europe. Also, MIYAVI has been selected as an actor in the film “Unbroken”, which will be directed by Angelina Jolie. This is the first breakthrough into the Hollywood movie screening industry for MIYAVI. The movie is set to be released in December 2014. 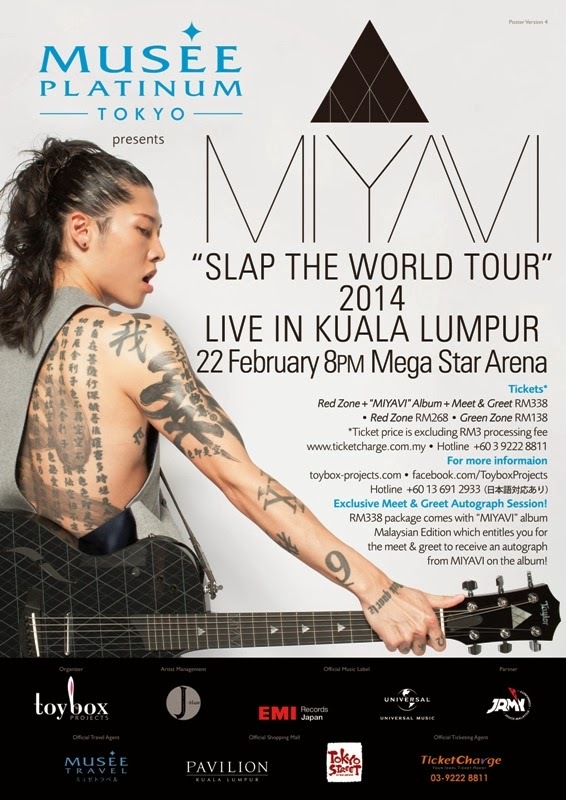 In his “Slap The World Tour”, Kuala Lumpur will be the first stop in the Asian region, MIYAVI will be having his concert here on 22 February 2014 in Mega Star Arena, a new venue for live concerts opening in 2014, at 8:00pm. Tickets are sold at RM338 / RM268 / RM138. For the RM338 ticket price, it will be packaged with a Meet & Greet session with MIYAVI, and fans will be able to receive an autograph from MIYAVI himself. This package is open to 100 fans only. MIYAVI “Slap The World Tour 2014” Live in Kuala Lumpur is Organized by Toybox Projects and Presented by Musee Platinum Tokyo; with Artist Management by J-Glam; Official Music Label by EMI Records Japan and Universal Music Malaysia; Musee Travel as the Official Travel Agent, Royal Chulan Hotel as the Official Hotel; Pavilion KL as Official Shopping Mall; and Jrock Malaysia Community as Partner. For further information, please log-on to either www.toybox-projects.com or www.facebook.com/ToyboxProjects or call the hotline at +60 13 691 2933.